Although it is technically a pathway in the Mackinaw State Forest, Pine Baron is more like a city trail on the edge of Gaylord. The pathway is less than 3 miles from the heart of the Ostego County seat and so endeared by locals that they fund its grooming during the winters when the Department of Natural Resources can not. Named for the lumber barons who clear cut the land in the late 1800s, Pine Baron was built in 1978 as primarily a cross-country ski trail in a region of Michigan that averages more than 180 inches of snow per winter. The pathway is a set of four, interconnected loops that range in length from 2 to 2.5 miles and fan out from a parking area into a forest of hardwoods and pines. The trail's perimeter is a 6.2-mile route while three crossover spurs and a pair of two-tracks that bisect the system makes its easy to put together an outing of almost any distance. 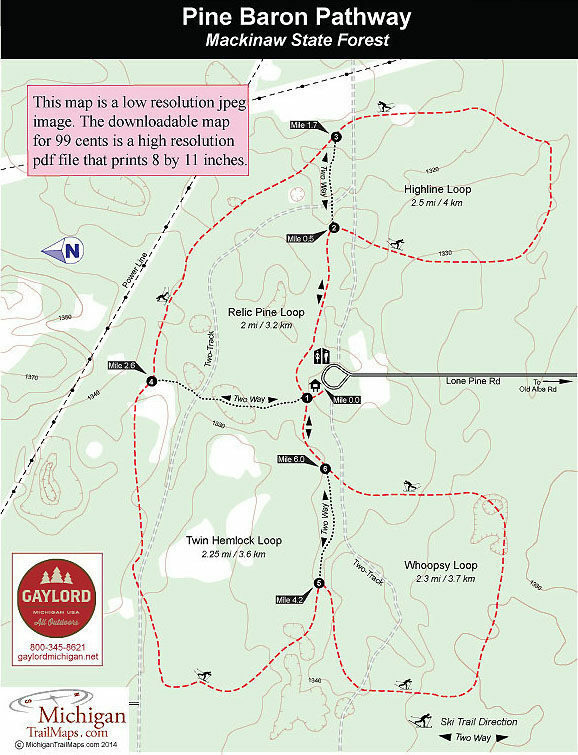 Three loops, the 2.5-mile Highline Loop, 2-mile Relic Pine Loop and the 2.25 mile Hemlock Loop, are relatively flat with only a few minor changes in elevation. The 2-mile Whoopsy Loop does include a few more descents and climbs but is still only mildly challenging even for novice skiers. 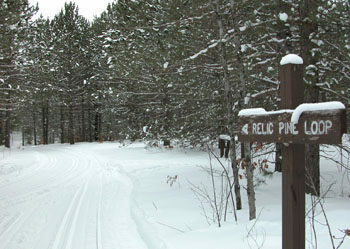 Pine Baron is most popular in the winter when it is groomed as a double-tracked trail for classic Nordic skiing. The rest of the year it attracts mainly mountain bikers, especially those new to off-road riding and looking for a gentle, undulating path in the woods. 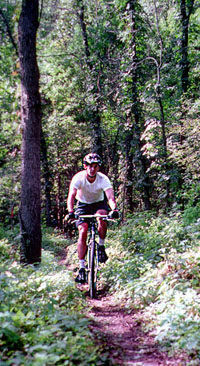 More serious mountain bikers usually head to the far more challenging single-track in Gaylord's Aspen Park. Although Pine Baron is not the wilderness-like setting of many of the trails just to the north in the Pigeon River Country State Forest, it does make for a quick and pleasant outing for anybody staying or passing through Gaylord. In early October it's a beautiful place to soak in the autumn colors. The pathway is extremely well marked with maps at every intersection with signs specifically pointing the way to the parking lot. Post No. 1 is just off the trailhead parking area and from it all three trails departing into the woods are two-way, allowing Nordic skiers to reach any of the four loops. All other trail sections are one-way during the winter and followed in a counter-clockwise direction. Obviously mountain bikers have the freedom to go any direction they want. For the perimeter route, head east (right) at post No. 1 to reach post No. 2 within a half mile The first loop, called the Highline, is just a pleasant 1.2-mile ride through a beautiful pine forest that eventually swings north and crosses cross a two-track to arrive at post No. 3 at Mile 1.7. Here you have the option to head west (left) back to the parking lot for a 2.5-mile loop. Continue straight to follow Relic Pine Loop. You begin in pines but within a half mile break out into an opening where power lines are visible to the east. You quickly re-enter the woods and arrive at post No. 4 at Mile 2.6. Again, you can return to the parking lot in about a half mile by heading south (left). Due west is Twin Hemlock, the only loop that rolls through a hardwood forest. The trail first winds along the edge of clearing, the site of the old homestead and another reminder that the sandy northern Michigan soil makes for poor farming. During the Great Depression in the 1930s poor, itinerant farmers moved to northern Michigan because of the cheap land available for homesteading. They soon found out it was unsuitable for conventional farming, and most left leaving weathered buildings as a legacy to that era. The trail crosses an old farm lane and then swings south to post No. 5 near Mile 4. Continue straight ahead at the post to return to the parking lot for a 4.4-mile outing. Or head right for the most entertaining section of the pathway. The Whoopsy Loop is a 1.5 mile-segment and just beyond the junction is the first hill of the day, a small slope easily negotiated. Two snow bowls followed and each one features another gentle downhill run that sends skiers gliding into the open areas scattered with jack pine and century-old tree stumps. At post No. 6, reached at Mile 6, head east (right) to return to the trailhead in a quarter mile. Along with a parking area and information board, there is a vault toilet at the trailhead but no source of drinking water. There are no vehicle entry fees at Pine Baron Pathway but there is a donation canister to help with trail grooming. From I-75 depart at exit 279 and head south on Old US-27 briefly and then turn right on N. Otsego Lake Road. Continue west on Old Alba Road for 3 miles. Turn north on Lone Pine Road to reach the trailhead at the end of the road.